Over the holiday period, at the suggestion of my wife, I reviewed my pile of magazines and brochures with a view to getting rid of most of them. As always happens in these circumstances you start to re-read articles or find things you missed the first time round. One interesting booklet I found was the catalogue to the 2014 Salon QP. This reminded me of two brands that I saw there of which I have heard nothing since. The first being Meridian watches that had always struck me as being in the vanguard of the new British watch resurgence. Their website has for sometime now just continued to announce the “new website – coming soon”. The second being Valour watches with their aeronautical engine inspired “Sopwith” watch. I have written to both companies to see if they have any news for us. I will let you know if I get anything back. Then reflecting on the past year for Grinidgetime. I think 2015 was an important year if only because I have managed to keep the blog updated regularly, which was something I doubted I would manage. I have also really started to enjoy meeting the characters involved in the small British watch community. The highlight has to be shaking Roger Smith’s hand at the Salon QP. But also really enjoyed chatting over a drink with Piers Berry and Alexandre Meerson, both really interesting people. On the other hand I have also noticed that the international watch blogger/forum world is less friendly and people can be very jealous of their followers and do nothing to encourage the idea of community that I thought I would find. Best wishes to all my visitors, especially anyone returning for more than a second look. Imagine my interest when I saw a small poster at Cutty Sark Gardens DLR station the other morning advertising the “Greenwich Gate Watch”. The watch shown had a miniature replica of the clock on the Meridian line in Greenwich Park. I had to investigate. My first thoughts were, what an odd name, I do not really understand the significance of “gate”. I have got to the bottom of the story. This is a Kickstarter project to launch a new range of watches, Reading all the information I am a little disappointed. The movement is a Chinese Seagull and it would appear the watch is assembled in Italy.Maybe I will get to talk to the projects backers soon and understand if they want to make something a little more British. In the year 1849, the engineer Charles Shepherd Junior (1830–1905) patented a system for controlling a network of master and slave clocks using an electric way, the galvanism. Shepherd installed the public clocks for the Great Exhibition in May 1851. By August 1852, he had built and installed the network of clocks and cables in the Royal Observatory, in Greenwich, London. The Gate Clock originally indicated astronomical time, in which the counting of the 24 hours of each day starts at noon. The clock was changed in the 20th century to indicate Greenwich Mean Time (GMT), in which the counting of the 24 hours of each day starts at midnight. Currently, the Gate Clock continues to show Greenwich Mean Time, and it does not show daylight saving time. A few meters behind the clock, pass the Greenwich Prime Meridian Line, based at the Royal Observatory. This meridian was established in London by Sir George Airy in 1851. By 1884, over two-thirds of all ships and tonnage used it as the reference meridian on their charts and maps. In October of that year, during the International Meridian Conference, this meridian was selected as the Official Prime Meridian of the world.The Greenwich Prime Meridian is still now the worldwide Time zone reference. The original idea to create a wristwatch version of the Shepherd Clock, bornt in the summer of 2014, in London. 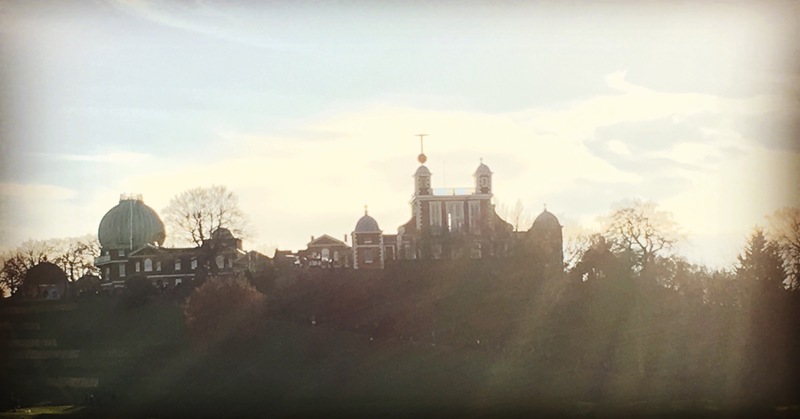 During a visit of the Royal Observatory of Greenwich, we remained fascinated by the Shepherd gate clock and its history. That’s why we decided to search for a wristwatch replica of this historical masterpiece. To our great surprise, we found out that no one had ever made a wrist version of this clock, considered by many people the world’s most popular GMT Clock. After a careful analysis, we realized there were several factors preventing an easy replica of this watch from being marketed. The first one is the particular dial and ring shape, both difficult to be properly executed in small dimensions. The second, but perhaps most important reason, is the movement: The clock has got a 24h movement with hours and minute in the main dial and seconds in the high positioned subdial. There are watches with the 24h movement mechanism in the market, but nobody with this very particular feature. Later on, during the design phase, we added the 12h movement version, to share with the twelve hours watch users the unique design of this famous clock. Characterized by a 24 hours and minutes hands on the main dial, plus the small second hands on the high subdial. The mechanism is a fully-automatic self winding type with the GTG logo engraved on it. Characterized by a 12 hours and minutes hands on the main dial, plus the small second hands on the high subdial. The overall dimensions are the same of the 24h version, as the fully-automatic self winding mechanism, with the GTG logo engraved on it. Each movement is tested in the Italian Assembly Department, responsible for the manufacturing of the watches and for the quality control. The two movements come with the same dimensions: 30.4 mm diameter and 7.4 mm thickness. Exclusively for the Kickstarter campaign, we are proud to announce that the watches will be numbered. Every backer from Kickstarter will have her/his own watch engraved at no additional cost. The incision will be on the movement and it will follow the production order – from the first baker’s watch with the lowest number (e.g. “001/ —-“), until the last one. The numbered limited edition won’t be available for watches sold after the Kickstarter campaign. The first design step consisted in defining a 3D cad watch-case that could maintain the original shape of the Shepherd Clock, with a luxury design that could exalt its character. For this reason, the case is linear, without shapes and with the crown in the bottom (at “6 hours” in the 12h model, at “12 hours” in the 24h model). The ring is probably the most particular and distinctive part of this watch. Its colored in black for the standard GTG model, as the original Shepherd one. To preserve the original layout, we decided to use the 316L Stainless Steel with Black IP coating, a modern treatment used from many of the most luxury watch manufacturer. To create a symmetry in the watch, even the exhibition case on the back is the same color. There is also a more classical version available, with natural 316L Stainless Steel. The next steps was to create prototypes in ABS material, with a stereo lithography 3D printer. This test was crucial in verifying the space required for the crown setting and the strap positions. Another distinctive and particular element of the clock are the hands. We have made photo chemical milling prototypes of these ones as well. We decided to add the 12h version to share the unique design of this famous clock with people that prefer this kind of movement. The Greenwich Time Gate logo is inscribed on the Ardillon Buckle and on the Deployant Buckle (“butterfly type” – STRETCH GOAL). The last step was to find the straps. Due to the high amount of combination available until this point, it was necessary to choose high quality straps suitable for different combinations. In addition to these models, we have the Silicon strap (black) and the Nato type straps (4 colors), available for everyone as STRETCH GOALS. These are the main models in the collection. You can see the full catalogue (51 models) and the specifications at www.gtgwatch.com. All the watch are sent with the GTG wood pack box. The packaging is composed by a luxury wood box, with a material inspired to the Greenwich park trees, in the typical English brown oak wood. The production plan of the GTG will include, at the end of the production, a testing time, for the quality control of each singol watch. During the past two years we employed our energies and time to make our working prototypes reach production quality. Prior to our Kickstarter campaign, we have been rigorously testing our products and we’re confident that we’ll meet or beat our projected delivery dates. Our manufacturers stand ready to activate production as soon as we meet our Kickstarter funding goal. In addition, we built in extra time for the manufacturing process and are confident we will ship by the projected dates. We will always keep you informed if (in the rare chance) things take longer than planned.